A well-built and optimised website should generate revenue, strengthen your brand and relieve pressure on your customer support. But the demands and complexity of modern day websites have risen enormously in the past few years, leaving many outdated and broken. It's an incredibly fast-moving space with the goal posts shifting all the time. However, there's no point in spending money on a website if it's not well maintained. There are four critical pillars, or legs, which, if you pay attention to and maintain regularly, will help ensure your website stays up to speed. These four legs can be referred to as Quality, Experience, Marketing and Technology, and following are some tips on how you can monitor and maintain them to ensure they continue to support your site. A poor quality website reflects on your entire brand. Simple things like spelling mistakes undermine the quality of your site, and poor grammar can confuse users. Other quality measures include things like broken links, broken pages or missing files. Even seemingly small errors can consciously and subconsciously put your prospects and customers off. It's essential to regularly check that your site does not throw any errors, especially if it's one that is updated frequently. Even static sites fall victim to broken links and missing files when linking to external sites or as a result of software and server updates. Check your site for spelling errors. Test your site for broken links. Good user experience is key to an effective website, but with an ever-expanding range of devices and technologies, it's harder than ever to measure. According to StatCounter data from the end of December 2017, 56.6% of global internet traffic came from mobile devices. So making sure your website mobile experience is good is critical. You want to make sure that all pages fit on mobile devices without horizontal scrolling, that text is large enough to read, that links are big enough to press with a finger and that pages support pinch-to-zoom. Speed also has a significant effect on user experience. Before a user can do anything on a website, it must first load, and the longer pages take to load, the more people will abandon your site. On average, a one second delay results in a 7% reduction in conversions. So the last thing you want is to keep users waiting. Luckily, your site speed is quite easy to measure. Check how fast your site loads and overall performance. Test how your site renders in different browsers and devices. Websites today face a huge range of marketing concerns: search engine optimisation (SEO), social marketing, local presence and so on. How do you stack up against your competitors? Are they ranking higher than you? Do they have more social engagement than you? It's important to know where you stand so that you know what needs to be improved. We will go into more detail on another blog post dedicated to this subject, but here are a few things to look out for and check regularly. Metadata is information about a page. Every page can have a title, description and image, which are typically shown in search engine results pages, and in social networks like Facebook. Ideally all images, audio and video should specify text that describes them to search engines and people with disabilities. The so-called alternative text is key to both SEO and accessibility. Backlinks are links from other websites pointing to your website. They are a strong source of credibility to search engines, and crucial to SEO. Ideally, a website should aim for a diverse range of backlinks from high-quality sources. Duplicate content is where identical content appears at different web addresses. For example, if yourdomain.com and yourdomain.com/home both appear to be the same page with the same content. Duplicate content is harmful to SEO and should be avoided wherever possible. Do a technical SEO audit of your site. Does your site redirect from www to non-www? Websites should handle URLs with a www prefix and redirect them to a non-www prefix wherever possible. Does your site redirect HTTP to HTTPS? Websites should redirect non-SSL pages to SSL pages wherever possible. Does your site have a working "Page Not Found" page? Websites should display an error page when pages are not found, which must return a 404 error code. Are all pages using SSL? Google is progressively penalising websites which avoid SSL, in both search results and the Chrome browser. Check out the numerous tools available for testing almost everything. Are you allergic to admin? If the thought of doing the above manually gives you a headache, check out our offer below. 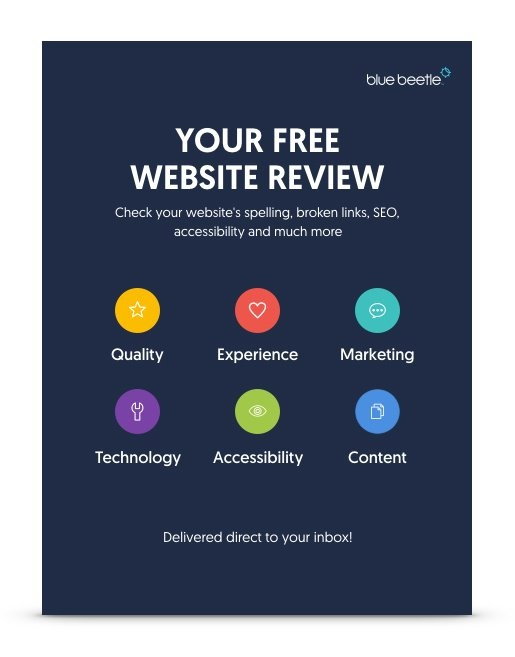 We'll review your site for you and send you a report by email! We'll even provide a free consultation and gibberish demystification session if you like.